Hobbyists and Arduino enthusiasts searching for an inexpensive way to add speech to their next Arduino project may be interested in a new piece of hardware which has been created by Kickstarter serial entrepreneur Patrick Thomas Mitchell. Who has this week launched his 26 Kickstarter campaign to raise funds to take his Arduino speech synthesizer into production. Watch the video below to learn more about the Little Buddy Talker Arduino speech synthesizer which is capable of accessing a word library of 254 words allowing you to easily add speech to your next project. The tiny Arduino speech synthesizer word library consists of colours, commands, months, days, time, numbers, directions, feelings, units of measurement, security words, math lingo, and general words. The collection can be combined in any combination and are spoken by “Lucy” which takes the form of a digital female voice with an English accent providing a more human feel to your project. 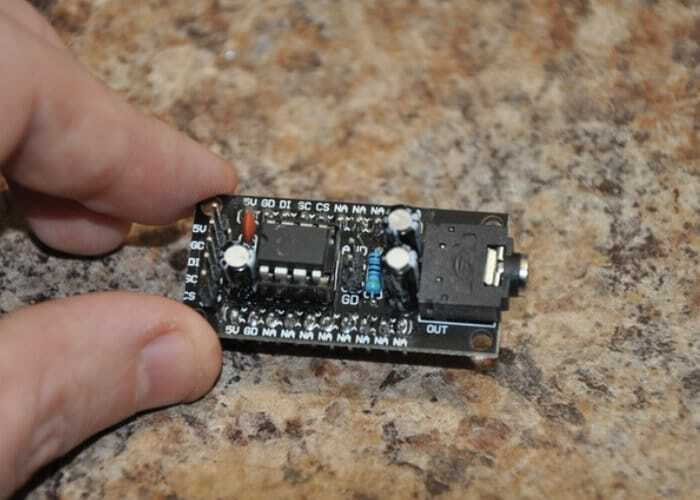 The Arduino speech synthesizer measures just 1.75 x 0.83 inches in size and the SPI communication lines can be connected from either from the top of bottom sides of the board. Patrick has also designed the board to require just five connections that need to be made : the 5v line pin is the power supply line, the GD line is the DC ground line, DI is the SKI data input line, SC is the SPI SCLK line, and the CS line is the “Chip Select” SPI pin and it takes just a few seconds to connect your Arduino UNO to the Little Buddy Talker says Patrick. For more information on the Arduino speech synthesizer jump over to the official Kickstarter campaign page by following the link below where the small and on board is available to back just CAD $13 or roughly £8 with shipping expected to take place during February 2018.